Found this graphic piece of tray art just around the corner where I live, in a newly opened design store called Decor run by Eva Mähler. Moods and marks of Helsinki in a nutshell. Graphic designer Maria Dahlgren has earlier made trays of Stockholm and Gothenburg – now she is on a journey around the world – travelling by tray. She captures the right Helsinki mood by using matching colours, such as tones of greens, blues and blacks. 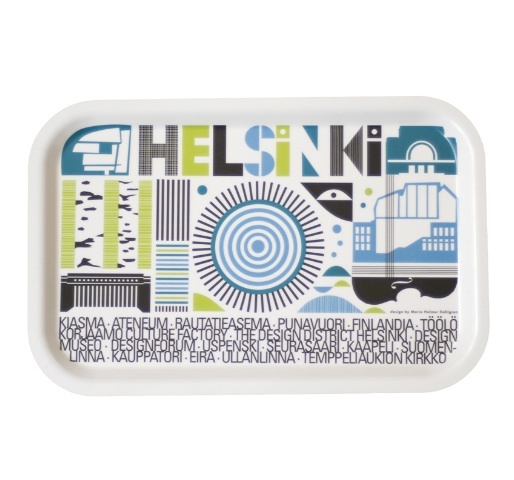 In addition to the Helsinki tray, there is also a Helsinki dishcloth, capturing the essence of the city. On sale at Huset-Shop online. If you’re in Stockholm, pop in at Decor store, Storgatan 30 or visit Maria Dahlgren’s showroom, Kungsgatan 90.